The Ripley Wolves will play in the AA playoffs against the other top teams in the WOAA Senior A League. Where they’ll finish will be decided after their make-up game on Saturday, Jan. 28, in Clinton, at 8:30 p.m. The Wolves fell 6-2 to first place Saugeen Shores Winterhawks on Friday night but had a huge win against Shallow Lake at home on Saturday, 9-2. Scorers in Port Elgin were Devin Kemp, from Shawn Stewart, and Drew Davidson, from Brett Catto and Blair Pollock. Kurt Edwards made 30 saves in the loss. Eight different Wolves dented the twine against Shallow Lake, with Tyler Soehner, Dan Nicoloff, Jarred Colling (2), Catto, Kemp, Tyson Soers, Cody Britton and Jordan Turcotte scoring. Assists went to Catto (3), Patrick Weijak, Colling, Tyler de Vos (2), Turcotte (2), Davidson, Soehner, Ryan Armstrong (2), Stewart, Britton, Ryan Dudgeon, Soers and Hayden Allen. Mitch Campbell stopped 28 shots for the win. The Wolves are tied for fifth with Durham with 23 points, but are only one point up on seventh and eighth place Tillsonburg and Clinton. They could finish anywhere from fourth to eighth, depending on how the games play out this weekend. This website will not be updated the week after the Clinton game so refer to our page on Pointstreak or follow us on Twitter @RipleyWolves to get information about our first playoff games. Two weekend wins put the Ripley Wolves in the middle of five teams battling for positioning in the Senior AA playoff picture. Two points separate fourth and eighth place, with the top eight making the Sr. AA playoffs. A five-goal second period paced the Wolves to an 8-5 win over the Elora Rocks on Saturday night. Goals were scored by Shawn Stewart (2), Cody Britton (2), Brett Catto (2), Drew Davidson and Ryan Dudgeon. Assists went to Devin Kemp (2), Catto (3), Tyson Soers (2), Ryan Armstrong, Davidson, Matt Mah, Patrick Weijak, Hayden Allen, Tyler Soehner, Britton and Jarred Colling. Mitch Campbell stopped 24 shots in the win. On Sunday afternoon, the Wolves faced the second place Mapleton-Minto 81s, which were coming off a big comeback win in Saugeen Shores on Friday night. The Wolves played a great game and got an empty netter from Armstrong to win 4-2. Weijack, Dudgeon and Davidson had the other Ripley goals, while assists went to Davidson, Soehner, Stewart, Weijack and Catto. Kurt Edwards was fantastic, stopping 40 of 42 shots for the win. The Wolves continue to chase fourth place and home ice in the first round this weekend when they travel to Port Elgin to face the Winterhawks on Friday night at 8:30 p.m. They then host the Shallow Lake Crushers on Saturday, Jan. 21, at 7:30 p.m. They wrap up the regular season with a make-up game in Clinton on Saturday, Jan. 28, at 8:30 p.m. in Clinton. 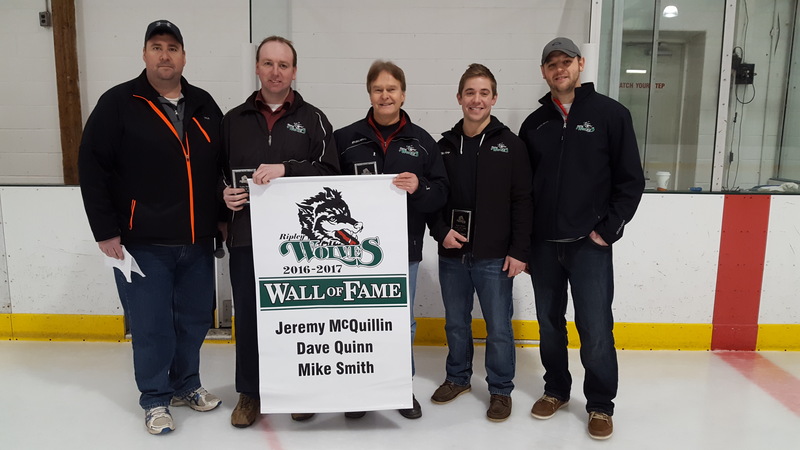 Kevin Taylor, left, Wolves President, Mike Smith, inductee, Dave Quinn, inductee, Jeremy McQuillin, inductee, and Mark Smith, Wolves General Manager. The Wolves added three deserving names to its Wall of Fame on Sunday afternoon. Jeremy McQuillin’s name and number has appeared on a game sheet more than anyone in Ripley Wolves history. He is fifth in regular season games played with 236, fifth in goals with 125, fourth in assists with 216 and fifth in points with 341. In the playoffs, he’s seventh in goals with 47, third is assists with 93 and fifth in points with 140, while not even cracking the top five in playoff games played. He’s also third in both regular season and playoff penalty minutes with 511 and 206 respectively. Aside from his on-ice accomplishments, Jeremy is perhaps the most dedicated Wolf of his era – a player who truly loved his teammates and the organization. Now in his first year of retirement, he has taken a role with the Wolves executive. Dave Quinn was one of the first coaches to stand behind the bench upon the Wolves’ return to the WOAA Senior A league over 10 years ago. Though a young team in relation to their opponents, he led them to respectability throughout the league and some good playoff runs. After leaving the bench, he joined the team’s executive and served as Secretary for years, among other duties. He has also rarely missed a game in the score clock keeping track of goals, assists and penalties on the gamesheet, a time-consuming volunteer position that is of utmost importance. Mike Smith was the original goalie for the Wolves when they returned to the WOAA in 2003, guarding the pipes for four years. He was also instrumental in recruiting players and bringing legitimacy to those early teams, which may have struggled on the ice but were always entertaining to watch. For 14 years, he has been a member of the Wolves Executive, first as a player rep and today as a volunteer. His tireless dedication to the Wolves and his knowledge of hockey, ability to recognize a player’s strengths and weaknesses and understanding of how the league operates makes Mike’s a key voice to the Executive. After a week off, the Ripley Wolves will host the Elora Rocks on Saturday night for a 7:30 puck drop. The game is sponsored by the Ripley Legion Branch 440. On Sunday afternoon at 3 p.m., the Wolves welcome the Mapleton-Minto 81s to Ripley. The local Tykes will entertain the crowd between the first and second periods, while our annual Wall of Fame ceremony will take place between the second and third. Jeremy McQuillin, one of the Wolves all-time leading scorers, long-time coach and volunteer Dave Quinn, and invaluable executive member and former player Mike Smith will take their place on our Wall of Fame. Game sponsor is Brian Stanley Trucking.